Together with my former colleagues at the Puerto Rico Conservatory of Music, I performed an exciting program of chamber music of composers Roberto Sierra (b. 1953), Alfonso Fuentes (b. 1954) and Raymond Torres (b.1958), three Puerto Rico Conservatory of Music alumni who have successfully brought the rich culture of the Caribe into the realm of classical music. The concert included unique solos, duos and trios for clarinet, bassoon, cello, piano and bongos that range from Fuentesâ€™ Grammy-nominated â€œVoces del Barrioâ€ for clarinet solo and â€œMejunje del fagobongoâ€ for bassoon and bongos, to the â€œSalsa on the C stringâ€ for cello and piano by Sierra and the Hollywood-inspired trio for clarinet, cello and piano by Torres. The lively dances of the Caribe â€”bomba, plena, salsa, mamboâ€” are a constant inspiration in this program, which ends closer to home, with the boogie-woogie of the Sonata by Sierra. â€œBongo PasiÃ³n,â€ the work for bongos by Fuentes that gives name to the program, was a world premiÃ¨re. 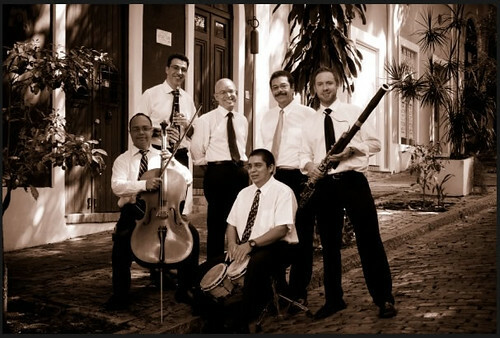 â€œUnlike much of the classical music written today, which sometimes can be hard to grasp at a first hearing, the music of Fuentes and Sierra is well rooted in recognizable dances of the Caribe, sometimes tinted by jazz harmonies, creating an earthy sound that can be understood right away,â€ says Oskar Espina Ruiz, who, in addition to being artistic and executive director of Treetops Chamber Music Society in Stamford, CT, and clarinet professor at the Puerto Rico Conservatory of Music, is the curator of â€œBONGO PASSIONâ€. The tour schedule included a concerts at Symphony Space, the newly renovated Museo del Barrio Hecksher Theater, a composers forum at Manhattan School of Music, and a concert at Loft Artists Gallery in Stamford, CT.
Saxton Rose © 2015. All your bassoon are belong to us.